The 2003 NFL draft was the procedure by which National Football League (NFL) teams selected amateur college football players. The draft is known officially as the "NFL Annual Player Selection Meeting" and has been conducted annually since 1936. The draft was held April 26–27, 2003 at the Theatre at Madison Square Garden in New York City, New York. [source 1] The league also held a supplemental draft after the regular draft and before the regular season. The draft was broadcast on ESPN and ESPN2 beginning at noon on Saturday, April 26 and beginning at 11:00 am on Sunday, April 27. The draft consisted of seven rounds, with teams selecting in the reverse order of the finish the previous season. There were 32 compensatory picks distributed among 15 teams, with five teams each receiving four additional selections. In addition, the Houston Texans, who started play as an expansion franchise the previous season, were granted a supplemental selection in the middle of each of the draft's final five rounds, plus the final selection in the final two rounds. There was little drama when the draft began with the Cincinnati Bengals selecting Carson Palmer, as Palmer had agreed to contract terms with the Bengals the previous day. He became the first Heisman Trophy winner selected first overall in the draft since Vinny Testaverde in 1987. The event ended nearly 30 hours later with Ryan Hoag being chosen by the Oakland Raiders with the final pick and thus gaining the distinction of "Mr. Irrelevant". The draft took an odd turn with the Minnesota Vikings' pick in the first round. The Vikings were apparently attempting to consummate a trade when their fifteen-minute time allowance elapsed. The Jaguars who selected next were quick to pounce, turning in their card to select QB Byron Leftwich immediately after the Vikings' time elapsed. The Panthers also took advantage of the gaffe, selecting OT Jordan Gross before the Vikings recovered and selected DT Kevin Williams. [source 1] Nevertheless, the mistake may have worked in the Vikings' favor as Williams went on to be a mainstay in their team, missing only four games in his first 10 seasons in the NFL and making six Pro Bowls (as of 2013). The colleges with the most players selected in the draft were Florida, Miami and Tennessee which each had eight players chosen. [source 2] Meanwhile, Penn State and Miami each had four players selected in the first round. Eleven defensive linemen were selected in round one, eclipsing the previous record of nine, set in 2001. [source 1] Ten underclassmen were taken in the first round, including three of the first four overall selections. The first round lasted nearly five hours. [source 1] The Buffalo Bills selection of Miami's Willis McGahee as the first running back off the board was notable because he was recovering from a career-threatening injury he suffered in the Fiesta Bowl which it was believed could have caused him to miss the upcoming season. 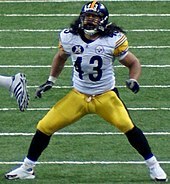 Troy Polamalu was the highest-picked safety in the draft and won two Super Bowls including multiple Pro Bowl and All-Pro selections with the Pittsburgh Steelers. Terrell Suggs was drafted by the Baltimore Ravens and went on to win the 2011 AP NFL Defensive Player of the Year Award and Super Bowl XLVII. In the explanations below, (D) denotes trades that took place during the draft, while (PD) indicates trades completed pre-draft. For each player selected in the Supplemental Draft, the team forfeited its pick in that round in the draft of the following season. "2003 NFL Draft". NFL. Archived from the original on November 17, 2006. Retrieved November 26, 2006. "ESPN.com: NFL Draft 2003". ESPN. Archived from the original on May 24, 2011. Retrieved April 14, 2011. "FFToday.com Draft Tracker". FFToday.com. Retrieved April 14, 2011. "2003 NFL Draft Pick Transactions". ProSportsTransactions.com. Archived from the original on May 21, 2011. Retrieved April 14, 2011. "2003 NFL Draft: Six Years Later". FootballOutsiders.com. Retrieved June 6, 2011. ^ a b c d e f g h i Hack, Damon (April 27, 2003). "N.F.L. Draft Starts on Offense, Then Shifts to Defense". The New York Times. Retrieved April 11, 2011. ^ a b c d e f g h i j k l m n o p q "Draft Facts". Milwaukee Journal Sentinel. April 27, 2003. Retrieved April 11, 2011. ^ a b c d e f g h i j k l m n o p q r s t u v w x y z aa ab ac ad ae "Draft Trades (Day 2)". Milwaukee Journal Sentinel. April 28, 2003. Retrieved April 13, 2011. ^ "Jets trade two picks to Bears for fourth overall". USA Today from AP. April 25, 2003. Retrieved April 11, 2011. ^ "Coles goes to Redskins after Jets fail to match offer". Philadelphia Daily News. March 20, 2003. Retrieved April 11, 2011. ^ "Bills acquire QB Bledsoe from Patriots". Sports Illustrated. April 21, 2002. Retrieved April 11, 2011. ^ "Saints trade RB Williams". Record-Journal. March 9, 2002. Retrieved April 11, 2011. ^ Hack, Damon (March 8, 2003). "Bills Trade Price and Make Offer to the Bengals' Spikes". The New York Times. Retrieved April 11, 2011. ^ "Gruden agrees to five-year deal with Bucs". ESPN. Retrieved April 11, 2011. ^ a b c "Bird ship Harris to Packers". Reading Eagle. March 1, 2003. Retrieved April 12, 2011. ^ a b c d Felger, Michael (April 13, 2003). "Pats win 'Skins game". Boston Herald. Retrieved April 12, 2011. ^ a b c d e f g h i j k Villioti, Tony. "Trade Index" (PDF). DraftMetrics.com. Archived from the original (PDF) on August 15, 2011. Retrieved April 13, 2011. ^ "The Saints Trade Roaf to the Chiefs". The New York Times. March 27, 2002. Retrieved April 12, 2011. ^ "Turley shipped to Rams for second-rounder". USA Today from AP. March 21, 2003. Retrieved April 12, 2011. ^ a b Banks, Don (April 14, 2003). "Saints acquire franchise safety Jones". Sports Illustrated. Retrieved April 12, 2011. ^ Banks, Don (April 25, 2003). "Pick-heavy Pats ship third-rounder to Fins for 2004 choice". Sports Illustrated. Retrieved April 12, 2011. ^ "Dolphins dump Gardener, pick up Williams". USA Today from AP. August 19, 2002. Retrieved April 13, 2011. ^ "Packers agree to terms on acquisition of WR Terry Glenn". Patriots.com. March 8, 2002. Archived from the original on May 19, 2011. Retrieved April 13, 2011. ^ "Browns trade Colinet Back to Minnesota". Toledo Blade from AP. October 17, 2001. Retrieved April 13, 2011. ^ "Redskins get Stai from Detroit". UPI. August 23, 2002. Retrieved April 13, 2011. ^ Richards, Joey (March 7, 2003). "Texans trade for 1996 La Marque grad Randall". The Galveston County Daily News. Retrieved April 12, 2011. ^ "Briefly in sports". The Topeka Capital-Journal. March 12, 2003. Retrieved April 12, 2011. ^ Tucker, Doug (April 20, 2002). "Chiefs Trade Up for UNC Defensive Tackle Ryan Sims". UNC (website) from AP. Retrieved April 14, 2011. ^ "Transactions". The New York Times. March 14, 2003. Retrieved April 14, 2011. ^ "Bears Deal McNown To the Dolphins". The New York Times. August 23, 2001. Retrieved April 14, 2011. ^ "Eagles acquire ex-Cat Simoneau". The Topeka Capital-Journal from AP. March 5, 2003. Retrieved April 14, 2011. ^ "Seahawks trade Charlton to Jaguars". Seattle Post-Intelligencer. June 21, 2002. Retrieved April 14, 2011. ^ "Transaction". The New York Times. August 20, 2002. Retrieved April 14, 2011. ^ "Dolphins make moves". Scout.com. April 25, 2003. Archived from the original on August 21, 2011. Retrieved April 14, 2011. ^ Johnson, Troy (August 23, 2003). "Redskins trade Rosenfels to Dolphins". Telegraph Herald. Retrieved April 14, 2011. ^ "Jaguars and Smith Agree to Terms". The New York Times. September 1, 2002. Retrieved April 14, 2011. ^ "Cowboys | Garmon Traded". KFFL.com. October 12, 2002. Archived from the original on November 3, 2011. Retrieved November 3, 2011. ^ "Saints release veteran RB Allen". CNNSI.com. September 1, 2002. Retrieved April 14, 2011. ^ "NFL Draft: Overview". ESPN. April 11, 2011. Retrieved April 15, 2011. ^ "Facts and figures on the 2003 NFL Draft". NFL. Archived from the original on November 13, 2006. Retrieved November 26, 2006. ^ "NFL Draft Compensatory Picks List". Sports Illustrated. March 25, 2003. Retrieved April 15, 2011. ^ "Fact & Figures on 2003 NFL Draft". National Football League. April 16, 2003. Archived from the original on October 29, 2013. Retrieved October 29, 2013. ^ a b "Minnesota Passes In NFL Draft". CBSNews.com. April 26, 2003. Retrieved April 15, 2011. ^ Hack, Damon (April 28, 2003). "High-Speed Precision On Draft's 2nd Day". The New York Times. Retrieved April 15, 2011. ^ a b "Hurricanes, Nittany Lions dominate first round". Sports Illustrated. April 26, 2006. Retrieved April 15, 2011. ^ "McGahee arrives in Buffalo". NFL. May 1, 2003. Archived from the original on September 8, 2006. Retrieved November 26, 2006. ^ a b Players are identified as Pro Bowlers if they were selected for the Pro Bowl at any time in their career. ^ "Roundup". The Gainesville Sun. October 3, 2002. Retrieved April 13, 2011. ^ "Kent State to Retire Antonio Gates' No. 44 on Saturday". Kent State University (website). February 24, 2010. Archived from the original on July 19, 2011. Retrieved April 14, 2011.